Please join The Floured Apron for a ladies night out of wine and chocolate tasting. 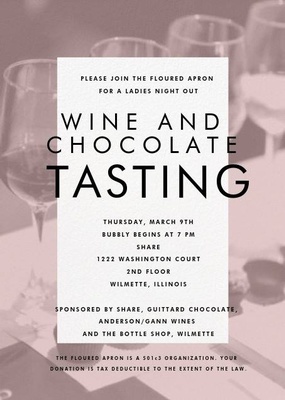 Share,Guittard Chocolate, Anerson/Gann Wines and The Bottle Shop, wilmette are co-sponsoring the event. All proceeds benefit The Floured Apron which is a 501c3 organization that empowers women from underserved communities with the training, knowledge and support to forge a new and more economically secure career path. Your donation is tax deductible.